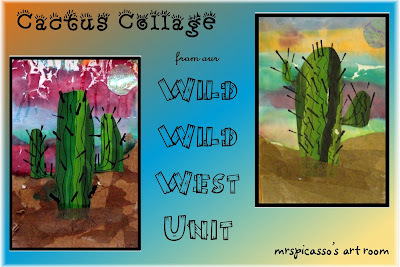 As promised, here is the lesson plan for our cactus collages from our Wild Wild West Unit. 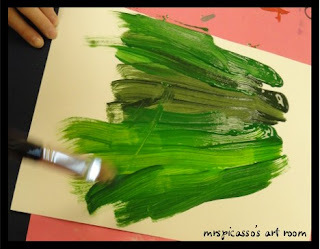 We began by painting the piece of white paper in shades of green. 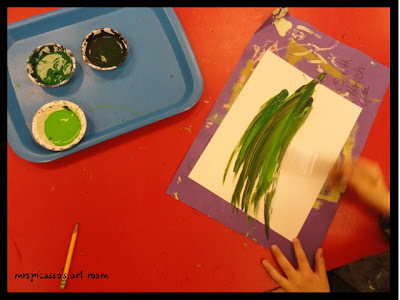 Be sure to have the students paint the paper horizontally and use the different shades of green to make a gradation in color from top to bottom. 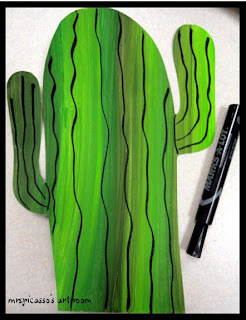 This paper will be used to make the cactus. Place these aside to dry. Next, we made the desert skies which will become the backdrop for our cactus. Use the spray bottle to wet the white tag and place strips of tissue in a horizontal fashion to create the sky. Spray the tissue again to adhere it to the paper. 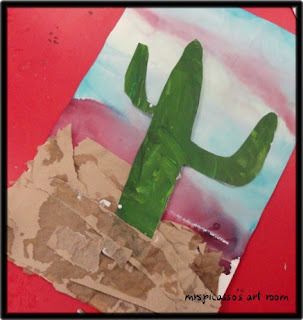 We only applied tissue to 2/3 of the paper because we would be adding the "sand" on day two. 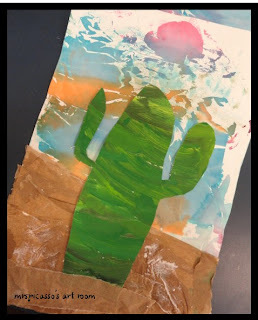 The tissue paper will bleed together and make a beautiful sunset. 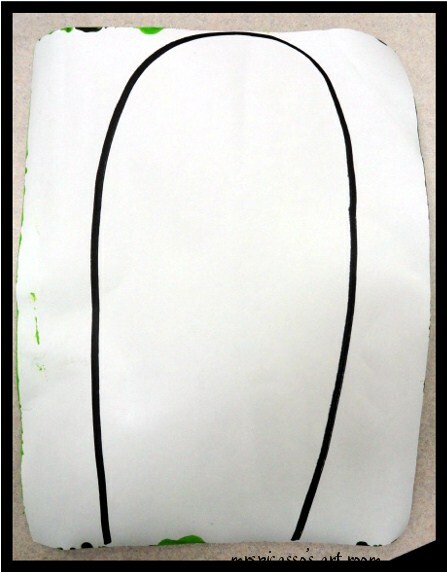 Allow tissue to dry completely and remove it from the paper and discard. 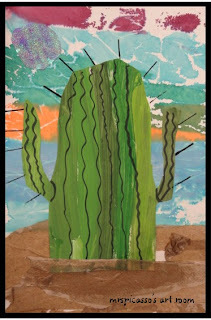 You will need Mod-Podge (I thinned it with water), foam brushes, and the toweling to create the sand. 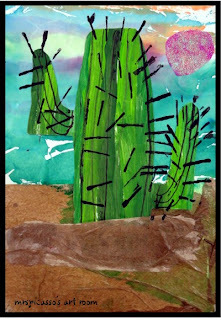 Tear the paper toweling in to smaller pieces and begin to apply, using Mod-Podge, as shown below. 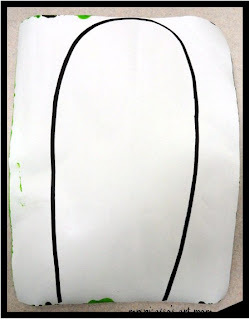 *Note: I LOVE using gloss Mod-Podge for its shiny finish, but simple glue thinned with water will work for this step and save on the cost of the project. 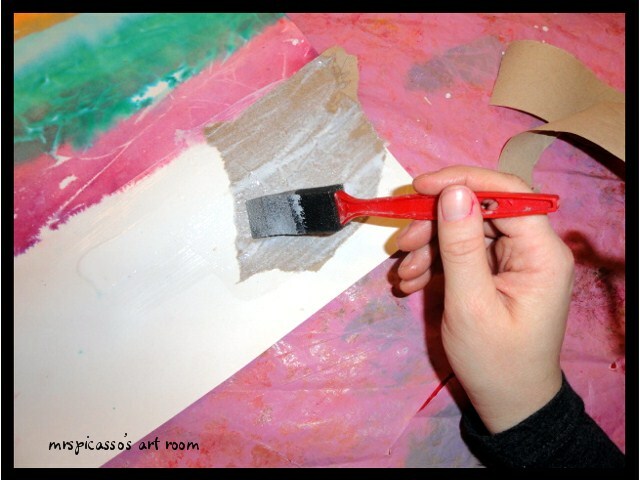 Brush the Mod-Podge on a small area using the foam brush. 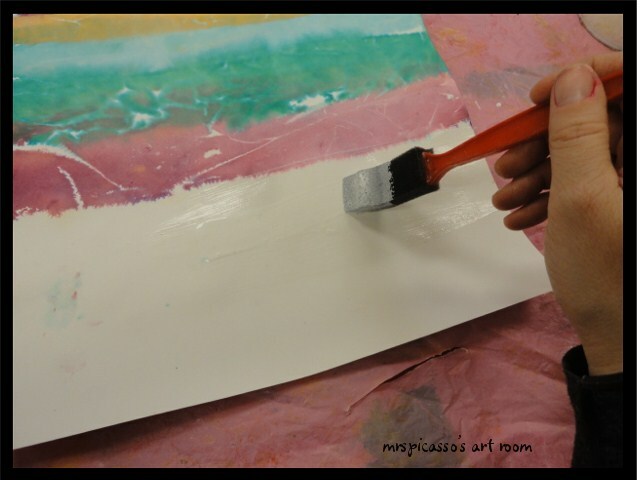 Place a piece of paper toweling in to the glue and brush more on top, completely covering it and assuring that it will dry flat. 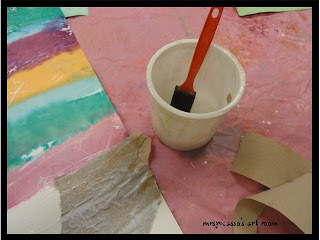 Here is how I usually set up the station- thinned glue in a frosting cup, one cup per table, one brush per person. 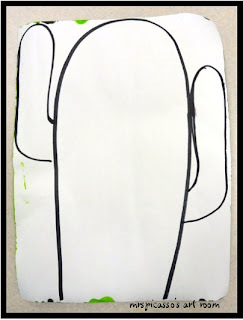 Continue adding the paper toweling until all of the white at the bottom of the paper is covered. 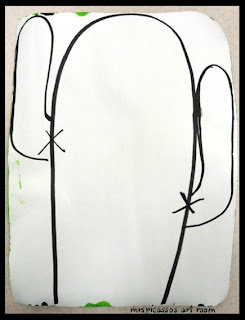 Draw an upside down U or ghost shape. Make sure it touches the top and bottom of the paper. Next, add the "arms" of the cactus. 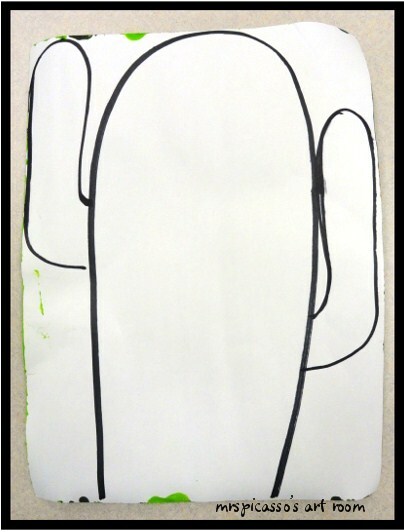 I encouraged the students to vary the height, size, and shape. 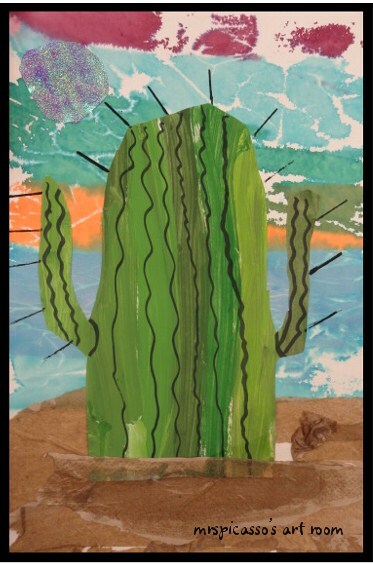 I then remind the students that they will be cutting out the cactus, but they should be careful not to cut off the arms! After the cactus is cut out, we used black marker to add some texture lines to the cactus. 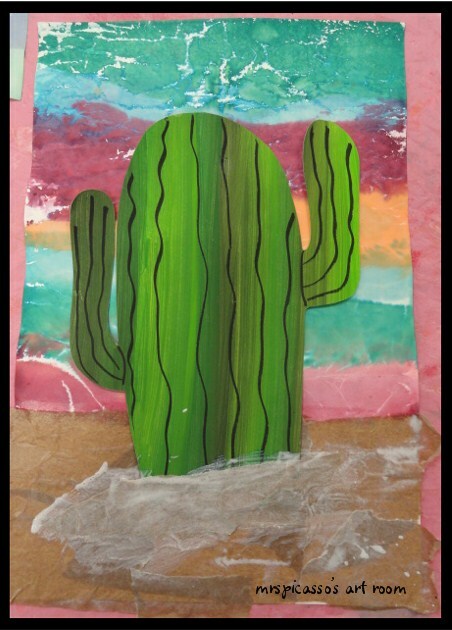 Personally, I didn't like the straight edge of the cactus growing out of the sand, so we added a strip of paper towel over the bottom edge to soften it. Use the same method as stated above for gluing. 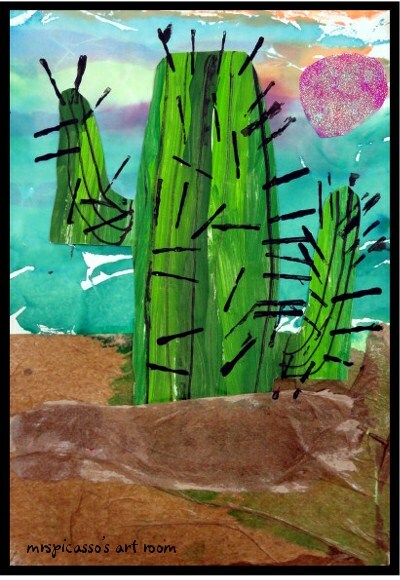 All that is left to do is add the details to the collage. 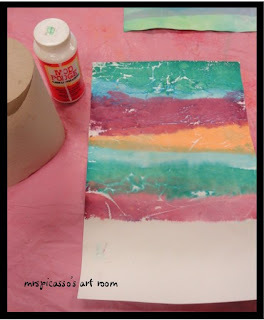 We created blazing suns from iridescent paper (I like to use Folia brand.) Ok, WHY is Blogger still not letting me to hyperlink??? 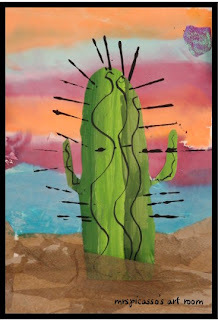 To finish, we added the needles using the edge of a piece of mat board (cardboard will work also, but may have a wavy edge if it is corrugated) dipped in black paint. I apologize- no photos of this process! 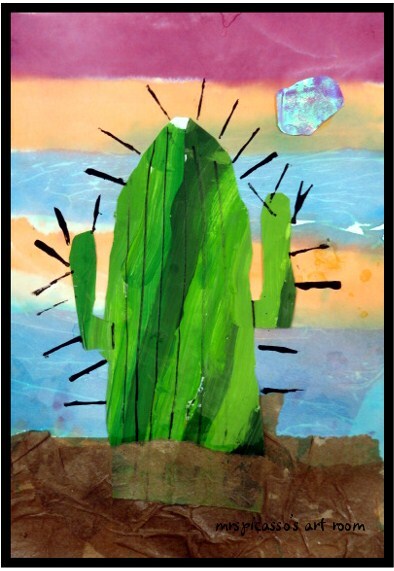 Here are some finished collages for you to enjoy! Very fun process. thanks for sharing! Great lesson! Love the process! These are fantastic!! I love the effect of the "bleeding" tissue background. And brown paper towels...how clever. I'd love to try this sometime! Wow- these are so effective! Respect for using such a variety of materials and steps with Grade 1!! They all turned out beautifully. 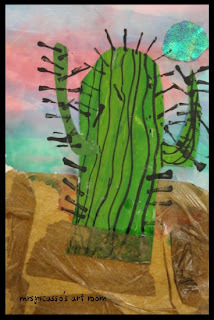 I love this cactus project so much that next year I am nominating you for the Top Art Teacher Blog of the year!!!! Completed this project today with amazing results. Children really enjoyed the process and the parents LOVED the end product. Thank you so very much! Thank you for all of the amazing feedback! 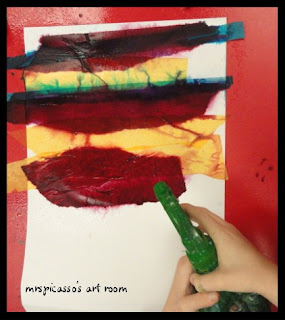 Next time, we will add tissue paper flowers. We forgot. One student reminded me as I was handing them back to go home. Face-palm! I love the picture. It is bright and vibrant and very funky. 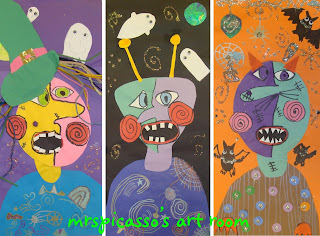 Beautiful and fun artwork. Fun fun I work at the Frederic Remington Art Museum and am always looking for projects with a western theme and feel to relate to his work. 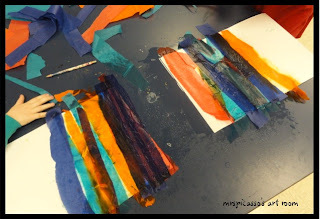 Thanks for sharing, what a fun process! This is beautiful! 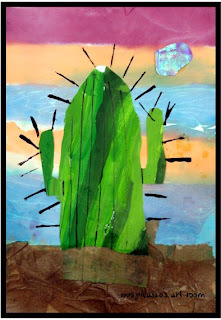 Is there a suggested age group for this project?